MANILA, Philippines - Korean rapper and YouTube sensation Psy's wish to chart higher on Billboard has come true. And fellow YG Entertainment artist G-Dragon, leader of boy band Big Bang, has joined him on the charts. Psy's "Gangnam Style" has jumped to 11th place on Billboard's Hot 100 chart from its 64th place debut last week, according to the latest music charts released Thursday. The song also leaped on other charts. "Gangnam Style" rose to fourth place on Billboard's Digital Songs chart, up from 25th last week and 49th the week before. It zoomed to No. 3 on the Billboard Canadian Hot 100 chart from 16th last week and 58th the week before. The hit song also charted at No. 28 on Billboard's Pop Songs, No. 68 on Radio Songs, No. 43 on On-Demand Songs and No. 4 on Korea K-pop Hot 100. "Gangnam Style" also maintained its No. 1 position on Billboard's Social 50 and YouTube charts. The track is currently No. 1 on the iTunes top 100 songs chart. In an interview with hip-hop magazine XXL before the new chart results came out, Psy said he was looking forward to seeing a "good result." "According to Scooter [Braun], because the ranking in iTunes is pretty high, and because of the Today Show and my appearance on the Ellen DeGeneres show, the buzz is getting bigger; the result in the Billboard charts next week will be quite phenomenal. Truthfully, I’m not expecting anything. Because I know the more you expect it, the more you get disappointed. But, I’m a human being, so of course I’m anticipating a good result. So I’m definitely pondering how well I’ll do on the Billboard charts. Right now, it doesn’t matter what ranking I’ll place on the charts, I think it’s a real historic moment," Psy told the magazine. Billboard.com said with "Gangnam Style" ranking 11th this week, "the Hot 100's top 10 could welcome two titles next week that vault to the region's doorstep this week." 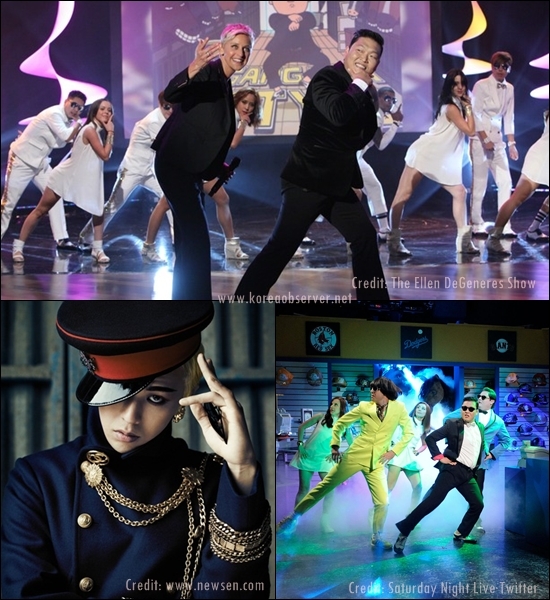 "K-Pop phenomenon Psy soars 64-11 with 'Gangnam Style,' which rockets 25-4 on Digital Songs (188,000, up 210%). Psy appeared on 'The Ellen DeGeneres Show' and NBC's 'Today' last week and made a cameo on the season premiere of the network's 'Saturday Night Live' over the weekend (Sept. 15). 'Gangnam,' buoyed by the buzz of its accompdanying dance featuring horse riding-influenced moves, simultaneously gallops onto On-Demand Songs at No. 43 (300,000) and Radio Songs (19 million, up 131%)," Billboard.com wrote. The "Gangnam Style" music video has logged in 221 million views on YouTube as of this writing. On the other hand, Psy would be happy to learn that another K-pop artist has made it to the Billboard charts. G-Dragon has released his first mini-album "One of a Kind" last week. The album debuted at No. 161 on Billboard 200, No. 1 on World Albums, No. 6 on Heatseekers Albums and No. 38 on Independent Albums charts. On iTunes music video chart, "Gangnam Style" and its second version featuring 4-Minute's Hyuna currently occupy the top two places while G-Dragon's "Crayon" is at No. 10.